The award winning Trinity Players. Music, comedy and drama at its very best. We welcome new members at Trinity Players and encourage you to consider joining our award-winning society. It is a lot of fun to step out onto the stage and entertain an audience. To feel their emotions move and sway in harmony with your acting, singing and dancing is a truly uplifting experience and one that possibly only the theatre can offer. There are a number of ways you can get involved and if the thought of standing on stage scares the life out of you please remember that it is not only the actors that make the shows happen. There is also a group of non-acting members who support the shows with lighting, sound, props, backstage handling, stage management, publicity, costume, makeup and a host of other roles. Currently annual membership costs £75. This payment makes you a member of Trinity Players and entitles you to audition for any role and perform in the musicals, plays and cabaret/choral events that we produce. You can only audition if you are a member. To discuss membership please contact our membership secretary Colin on info@trinityplayers.com. The success of Trinity Players is dependent on the invaluable support we receive from our 'Patrons'. So if you wish to be part of our 'Trinity family' but don't fancy getting up on stage then the role of a patron could be perfect for you. Patrons receive a free ticket to each of our shows, free interval refreshments and show programmes, invitations to special patron evenings and of course to our AGM. Many of our Patrons enjoy helping 'Front of House' for shows, selling programmes, serving tea, helping with Box Office and assisting the audience to their seats, but this is not something you are expected to do if you are a Patron. If becoming a Patron sounds like something you would be interested in doing please contact our Patrons Secretary, Ann Dempsey, on 0121 354 4357. If you like what you see and are interested in learning more about what we do, or are thinking of joining us then please email us at info@trinityplayers.com or visit us on Facebook. 4th - 8th June 2019. An uplifting and hilarious romantic comedy celebrating 1930's song, style and romance. 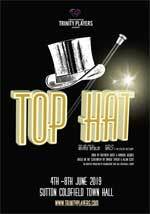 Top Hat is a sparkling show, guaranteed to have you dancing in the aisles! For more details see our Current Show page. Click on the image below to download a promotional flyer with ticket prices.